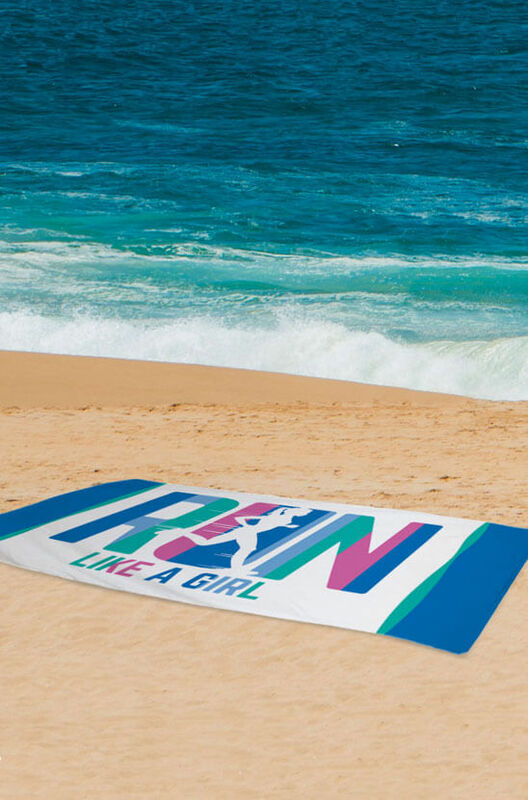 Perfect for runs along the beach or drying off after a dip in the pool, these beach towels for runners from Gone For a Run are soft and absorbent. 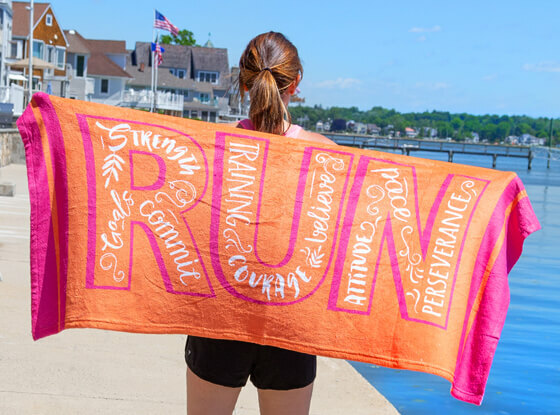 Whether you're a triathlete or just a runner who likes to swim, you'll love our running-inspired beach towels. They come in dozens of vibrant colors and patterns. Each one is printed with our original, running-themed artwork and text. Some can even be personalized with your name, city or other text of your choosing. Bring our running towels on your next vacation or use them to lay out by the pool next summer. They also make ideal gifts for any runner who likes to get wet now and then. We craft our beach towels from soft and lightweight microfiber that is made from 100-percent polyester. The thin design of these towels is meant to make them quick-drying in the summer sun. This eliminates the hassle of dealing with heavy, wet beach towels that get musty before they dry out completely. In order to give you plenty of room to lie out in the sun, our full-sized beach towels measure approximately 30 inches wide by 60 inches long. The soft texture also makes these versatile towels excellent light blankets, when necessary. Store and tote your running beach towel with ease with the included drawstring bag. Browse our entire collection of beach towels for runners to find the original design that suits you best. You can sort the designs by collection to find towels that are made for runner girls, runner guys and runner moms. Show the world your latest race accomplishment with our race distance or race city towels. These towels are perfect for marathon and half marathon runners as well as triathletes. There are also options for cross country runners and track and field athletes. Our state collection includes towels inspired by all 50 states while our zodiac collection is based on astrological signs. Dog-inspired towels are perfect for anyone who runs with their dog and run mantra towels provide the motivation you need to keep going.